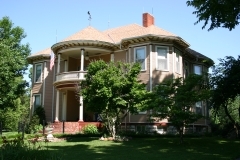 Architect George P. Washburn of Ottawa, Kansas, designed this two-story wood frame house, which was completed in 1901, in the transitional Queen Anne/Free Classic style. The Lanter House displays many of these Free Classical details - most notably the classical columns on the front porch. 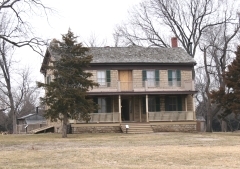 The house was built for Franklin R. Lanter, an Olathe lumber and coal merchant, who resided there until 1919. The variety of woods used throughout the interior of the home is a direct reflection of Lanter's ties to the lumber business. 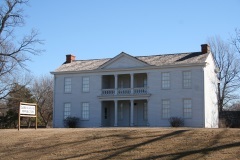 The flooring, trim, and carved mantels include a wide selection of woods such as curly maple, pine, and oak. 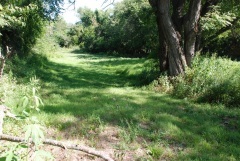 The Lone Elm Campground Swale is located in Lone Elm Park at the southernmost edge of Olathe. This city park's single trail swale is situated along the combined route of the Santa Fe, Oregon, and California trails as it headed southwest out of Independence, Missouri to present-day Gardner, Kansas where the Santa Fe Trail split-off from the Oregon and California trail. The earliest known group headed for Santa Fe passed through this site in circa 1823, and use of this part of the trail drew to a close in 1861 with the onset of the Civil War, which ended long-distance trail traffic from Independence. This trail remnant is one of the few intact trail remains in the greater Kansas City metropolitan area, as urban and suburban development has greatly encroached upon the trail in this region. The nominated site also contains a historical marker erected by the Daughters of the American Revolution in 1906. 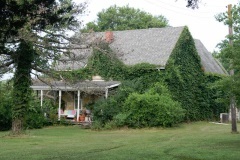 The property was nominated as part of the "Historic Resources of the Santa Fe Trail" in the areas of commerce, transportation, exploration/settlement, and social history. 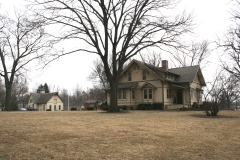 The Loomis Historic District is located near the intersection of Johnson Drive and Hadley Avenue. 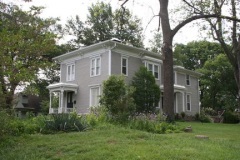 The district is a well-preserved collection of dwellings that represent the evolution of the property from farm acreage to a Kansas City suburb. Each of the four residences within the district exhibits a distinct architectural style that corresponds to a historic era of development in Johnson County, Kansas. 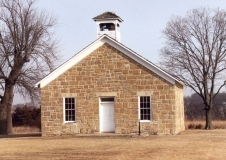 The early history within this district can be traced back to the Edgar and Emily Field Loomis family, who purchased the land in 1882. In subsequent decads Emily and her son Charles sold parcels of the land for development. 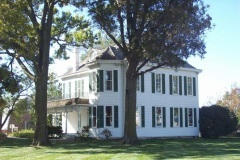 The district was nominated for its Italianate, Craftsman, and Modern architecture. 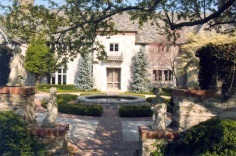 While the house and a majority of its landscape is within the Kansas City, Missouri boundaries, a portion of the landscape is located in Leawood, Kansas.